Paul Weller In Cardiff! – Paul Weller News! EVEN by his lofty standards 2010 has been a spectacular year for Paul Weller. Wake Up The Nation lived up to the rallying cry of its title by doing just that – causing mighty ripples in the music buying populace. Widely revered as his best album for a decade by critics and fans alike it propelled him to the cool climes of a Mercury Music prize award nomination and the curious inquisition of a younger audience. Right now the ever stylish 52-year-old modernist icon is at the height of his powers, mining a rich seam of creative inspiration. It’s a midas touch that has translated to his live shows. There’s always a joyful sense of communion about a Weller gathering and his thousands of devoted acolytes turned this worshipful service into an occasion that transcended a normal gig. This was something special. Opening up with the propulsive joys of Moonshine he then hurtled into the staccato strut of From The Floorboards Up before hitting his stride with 22 Dreams, Woodcutter’s Son and Eton Rifles, sending the middle-aged mods who bellowed out its stirring chorus into raptures. As an opening salvo it was a potent statement of intent – a strident purpose that he maintained throughout an expansive career-tracing set. On stage for close to two hours, highlights were many. Trees was a breathtaking sonic assault – innovative experimentation without the detriment of melody , No Tears To Cry illuminated the deliciously rich tones of Weller’s soulful voice, while the resurrection after 33 years of Art School dusted down from The Jam’s debut album was a thrilling surprise. 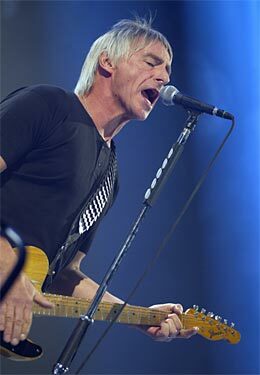 We’re treated to two encores and seven songs; Broken Stones and You Do Something To Me are especially rapturously received – while the gig spirals to a climax with the imperious blast of The Changingman, underlining just how much conviction and soul Weller puts into his rock n roll. Right now, he’s a live performer without equal. Previous Entry Paul Weller In Ireland! Next Entry Paul Weller In Brighton!